Ethel P. Savage is an elderly woman whose husband dies and leaves her approximately $10 million. She wishes to set up a fund to give away her husband’s money to people who want to follow their dreams, foolish though they may appear. To make her come to her senses, her three selfish stepchildren place her in The Cloisters, a comfortable and tasteful sanitarium. They, however, learn she has hidden the $10 million. What happens next? 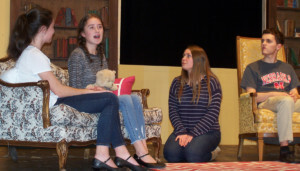 Come to the Honeoye Falls-Lima High School Drama Club’s production of The Curious Savage on November 9 or November 10. The show is at the HF-L High School Auditorium at 7:30 p.m. Tickets are $6 and can be purchased at the door. 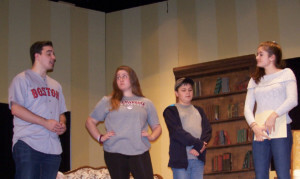 Cast members are Riley Goold as Ethel Savage, Kyle McDougall as Titus, Raelynn Bovenzi as Lily Belle and Adam Santucci as Samuel (all Ethel’s stepchildren), Molly Connors as Florence, Sam Gilbert as Hannibal, Christine Halfmann as Fairy May, Dominick Abraham as Jeffrey and Kendall Towner as Mrs. Paddy (all “guests” at The Cloisters) and Sydney Picciotti as Dr. Emmett and Hanna Coria as Miss Wilhelmina (staff members at The Cloisters). The student directors are Lyndsey Giuffrida and Leah Torregiano. Working as part of the crew for the show are Brooke Puchebner, Christina White, Lauren Connor, Gabby Patchett, Kaitlyn Yelencsics, and Jayme Smith (costume crew), Shira Silverstein, Taylor French, Smith and Yelencsics (props crew), Patchett and Jacob Fox (lighting crew), Michelle Waterstraat and Fox (sound crew), Smith, Brooke Erion and Owen West (set construction crew) and Tara Shaw, Ginny Roth and Erion (stage crew). The play is a comedic play that contrasts the kindness and loyalty of the psychiatric patients (in HF-L’s production, they are called guests) with the avarice and vanity of “respectable” public figures. There are also two parallel stories: Ethel trying to get her family to rescind the order that she be institutionalized and the other “guests” who are trying to live in a false world of their own making. For example, Florence believes she has a child named John Thomas but in fact, John Thomas is a doll; Fairy May is a compulsive liar who is obsessed with having others love her; Jeffrey is a military pilot who was the only survivor when his plane was shot down during the war and believes that he has a scar on his face and does not remember that he is married to Miss Wilhelmina; Hannibal was once a statistician who was fired and replaced by an electronic calculator and has now taken up the violin which he wrongly believes he can play beautifully; and Mrs. Paddy who paints only seascapes about as well as Hannibal plays the violin and who doesn’t talk much except to announce what she hates, which is pretty much everything. They are in contrast to Ethel’s stepchildren: Titus who is a U.S. senator but is the least popular senator in Congress, Lily Belle who has been married six times and is arrogant and Samuel, who is a judge with the most overturned decisions in the country and is in the shadows of his siblings. Hennessey said that many of the kids have come up with back stories for their characters, particularly the ones playing the guests but also others like Bovenzi and Picciotti. Picciotti plays Dr. Emmett, a role that was written for, and is usually played by, a male actor. This show is also unique in that this is the first fall drama show that any of the students have been in that has needed a set. While Picciotti admits there are challenges to the show like the plot being complicated and certain words and phrases being unfamiliar to the students, she says it has been great fun.